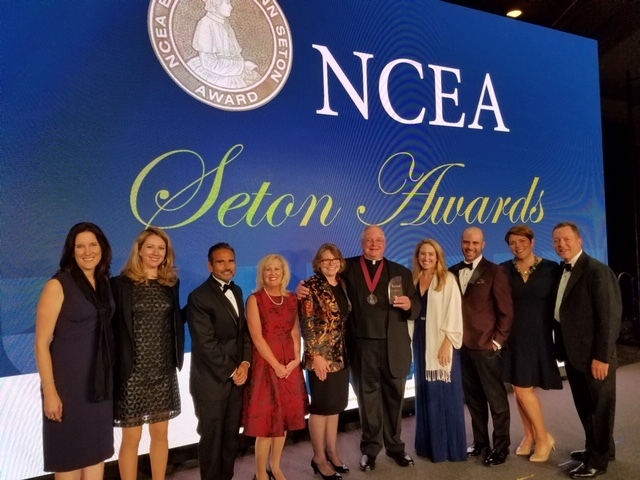 The Fordham University Graduate School of Education is pleased to announce that Reverend Joseph O’Keefe, SJ, received the National Catholic Educational Association’s (NCEA) prestigious 2018 President’s Award. 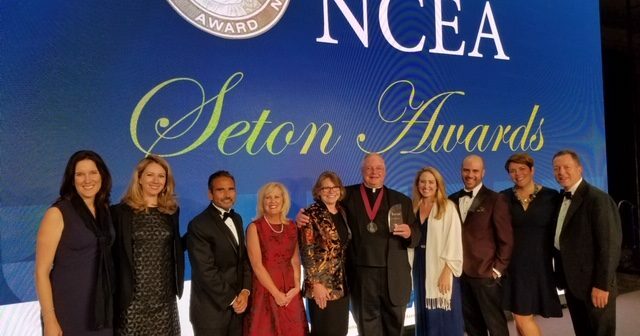 The award was presented to Father O’Keefe at the NCEA Seton Awards Gala on October 1, 2018 at the Omni Shoreham Hotel in Washington, D.C. The President’s Award honors a professional whose longstanding dedication to Catholic education has enhanced the wellbeing of our nation’s youth and American Catholic schools, in particular. Father O’Keefe, SJ, is a fellow in Fordham’s Center for Catholic School Leadership and Faith-Based Education, a scholar-in-residence in the Graduate School of Education, and serves as Rector of Ciszek Hall, the community for young Jesuits in formation studies. Prior to Fordham, he served as a tenured professor and Dean at the Lynch School of Education at Boston College and was a trustee at five Jesuit universities and three Jesuit high schools. He was reappointed by the United States Secretary of Education to a second term on the National Assessment Governing Board in 2017, where he currently represents the independent and private school community. Father O’Keefe, SJ is a popular professor in the Fordham Graduate School of Education’s Master in Administration and Supervision program and the Doctor of Philosophy in Church and Non-Public School Leadership program. His extensive research and contributions to Catholic education have resulted in numerous publications and citations. He will also be assisting in the planning and execution of the World Congress on Catholic Education, to be hosted by Fordham University in June 2019. For more than three decades, the Center for Catholic School Leadership and Faith-Based Education has been privileged to work with women and men who are committed to becoming such leaders. An internationally recognized expert on Catholic Education, Father O’Keefe is the editor or co-editor of 12 books and author or co-author of more than 40 articles and book chapters on Catholic education and educational leadership. In addition, he was the recipient of the F. Sadlier Dinger Award for his contribution to Catholic education. Father O’Keefe entered the Society of Jesus in 1976 and was ordained in 1986. He received his bachelor’s degree from The College of the Holy Cross and a Master of Divinity and Licentiate in Sacred Theology from the Weston Jesuit School of Theology (now the Boston College School of Theology and Ministry). In addition, Father O’Keefe received a master’s degree in French from Fordham University and a doctorate in administration, planning and policy from the Harvard University Graduate School of Education.